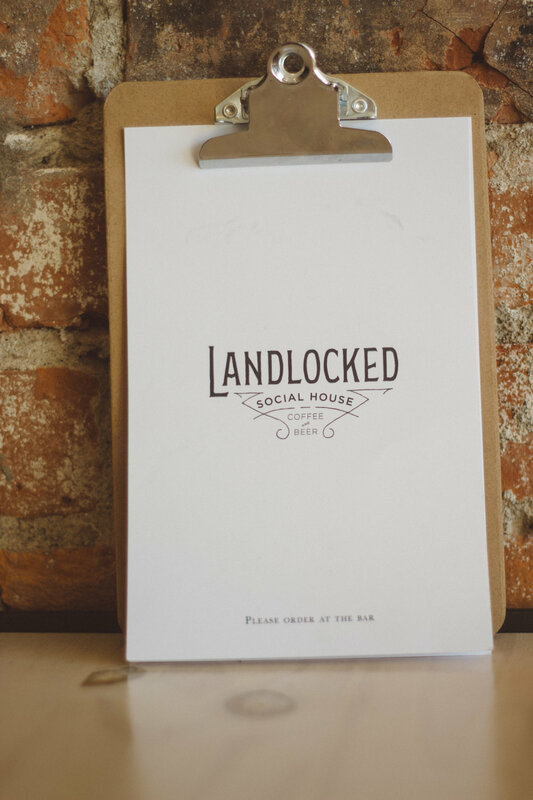 Laidback, unique, and inviting are just a few of the words customers have used to describe Landlocked Social House. It’s no surprise the spot is a hit among community members. With friendly staff, cozy seating, and exquisite beverages, Anne and Andrew Decker have created the perfect location to hang out and relax in Walnut Hills. 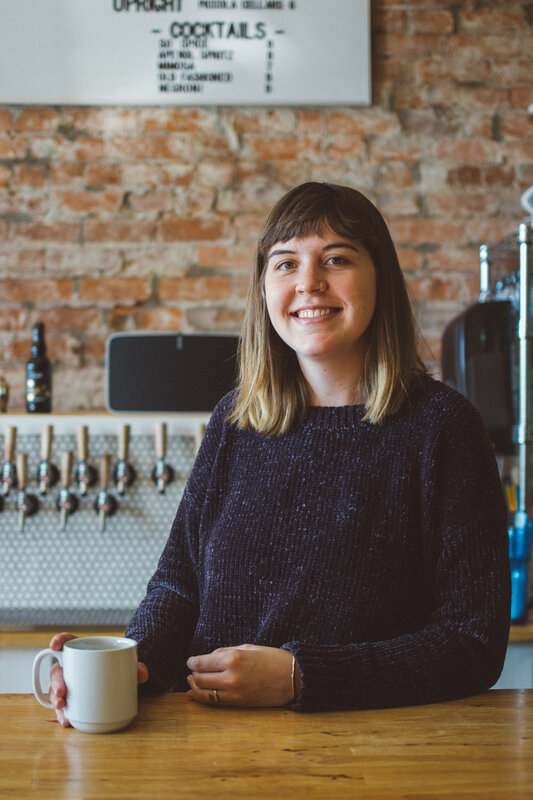 We sat down with Anne to hear about her entry into the coffee world and what she’s learned since opening Landlocked Social House. Interview by Liz Rosevear. Photography by Briana Davis. Tell us the story of how Landlocked Social House came to be. I would say it began because me and my husband Andrew both have always worked in the service industry. I’ve worked in coffee since I was 19. I started at Starbucks. So did he; that’s how we met. Then we went on to working at smaller entities in Dayton. I worked at Press Coffee Bar and he worked at a brewery. We both kind of knew that we really liked what we were doing, but we also knew that we couldn't grow more in the places we were. The only way to grow was to open our own business. I essentially ran Press Coffee Bar for a little bit and I really enjoyed that. I felt like I got to do a lot of work, but I also didn't have to take work home with me. It was just always a world that I really liked being a part of. It connects you to a lot of people. When I moved to Dayton, I didn't know a lot of people. 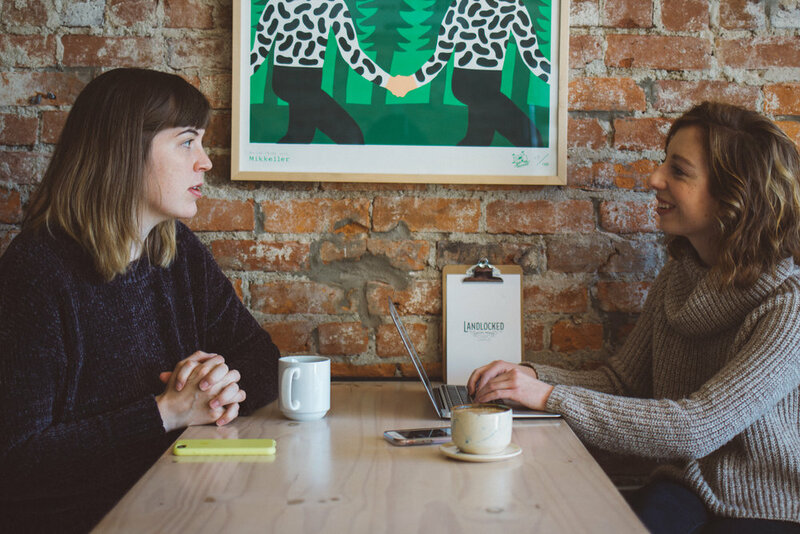 But working at Press Coffee Bar, I got to meet so many people, and I just wanted to create that here in Cincinnati: a place where people can meet and talk and get to know each other, and then relationships bloom. That’s why we like what we’re doing, because we feel like coffee and beer both connect people. Deciding to finally make the push was just because we were both like, we need to do this now or we’re going to have to wait another 10 years. Our friends own this building, and there was a space available, and it was just kind of like, do we go for it? We went for it; we made a business plan; we went to the bank. It all actually ended up working. We ended up building out this whole space ourselves. Being two people that have never done that – we’re not handy people at all – we learned everything along the way. It’s pretty cool to now know how to build a bar. We built our own walk-in fridge. We exposed the brick ourselves. We did all of that. Not only learning how to run a business but also learning how to build a business was pretty cool. What makes Landlocked Social House unique? The uniqueness is that we have both coffee and beer. A lot of places have done that, but what we’ve tried to do is really make sure that each of those worlds is run almost like their own thing. The coffee side is all staffed with people that are trained on the machine. The beer side is typically run by my husband. You can walk up and not know any of the beers on tap, but he will find you the perfect beer. Our thing is to make sure we have quality products but we're also encouraging people to try new things. We’re not scaring them away by having a list of beers you’ve never heard of. We make sure to let you sample whatever you want and talk you through it. We’re always striving for quality and approachability. I want people to stay awhile. I want them to not feel like the craft beer or high end coffee world is only for the people that know about it. It’s just good taste. Anybody can enjoy something that tastes good. On that note, can you tell us a little bit more about the menu? For the coffee side, we have a pretty traditional Italian menu. We always have a couple of Wood Burl Coffees on pour over. If you want to try something different, something that we're selling in retail bags, we can brew you a cup. We also have coffee that is brewed and ready to go every day. I find that to be a super important product to have for that person that comes in and wants to grab a cup to go. It also helps us have a lower cost option on the menu, which is really important. We sell Wendigo Tea, which is phenomenal tea. We have pastries from Mainwood Pastry. The people that own Collective Espresso started Mainwood Pastry. What’s really nice is since they own a coffee shop, they know the needs of a coffee shop. That’s the coolest part of what we do: We get to work with a bunch of different people and get to know them. We have 15 beers on tap. 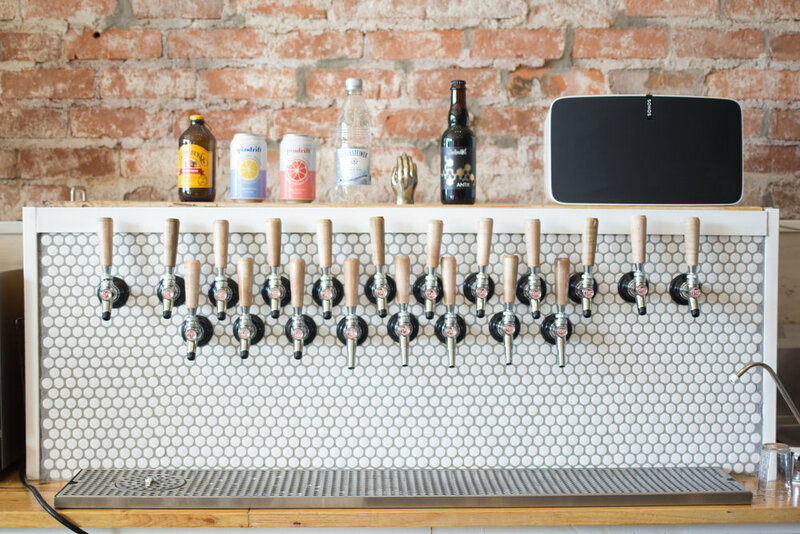 We do a red wine, white wine, a cider, and a Prosecco on tap. We also have a small selection of cocktails. Our main focus is, of course, the beer. For most bars, chasing after beer isn’t necessarily what somebody wants to do, but it’s what Andrew loves doing. We’ve got a pretty diverse tap list; we try to have something for everyone: darker beers, lighter beers, sour beers. It’s really rare that someone comes in looking for a specific style and we don’t have three options to give them. Andrew does a great job with that. We also try to have different price points. We’re going to have those higher end beers for people that come in searching for that. But we also have that $5 beer. We try to keep it all around $5 to $12. What does a day in the life of Anne look like? Currently it's shifted a little bit. My day right now begins with waking up and feeding the little guy. We have a three-month-old. I usually feed him, then Dad hangs out with him and I come to the shop to make sure there’s nothing that the employees need from us. We have some really awesome employees. That has made this transition of being business owners – and now business owners with a baby – so much easier. It’s really nice to know that when we can’t be here all the time, the place is still running the way we would like it to. Now that he’s a little bit bigger, we’re able to be around a little more again. I work a couple of days a week on the floor, but I’m still balancing needing to be able to feed him and also working. We went from our days being like, wake up, do some kind of crazy tiling or building out the bar. Now it’s like, wake up and actually do what we really wanted and love to do. That’s been the coolest part of doing it all ourselves, is that we felt the strain of actually building out the space. The stresses we have of being open do not even compare to some of the stresses we dealt with while we were trying to open the spot. We always try to remember that. Press Coffee Bar was owned by Brett and Janelle Barker. Janelle is someone I look up to a lot. I started working there when she was pregnant and kind of helped fill that void of her not being able to work all the time. But seeing how she balanced running things and keeping things organized at the shop and also having her little boy waiting with her – that made me see that I could do that, too. I have always intended to work but also have my kids around with me. Seeing that Janelle was able to do that made me realize that it was possible. She makes phenomenal drinks and is a powerhouse worker. She was a pretty important figure in my life. What advice do you have for women who want to open their own business? One thing is, talk to other small business owners. It is amazing how much everyone wants to help each other out. Everyone wants you to succeed. That’s something we definitely learned here in Cincinnati. Every time I thought there was going to be a big roadblock, we overcame it. One of the biggest things that we dealt with was when we applied for a liquor license for the space. We thought we were in the Community Entertainment District, which meant that our liquor license would have been only $2,500. In Cincinnati, liquor licenses are in the red, meaning you have to buy them privately. This allows people to sell them for a lot more money. We applied for the liquor license and the state contacted us and told us our block was cut out of the Community Entertainment District a month beforehand. We ended up having to buy a liquor license privately for a crazy amount. We had our Kickstarter event with a goal of raising $23,000, which is kind of unheard of for a coffee shop to reach that big of a goal. This is when learning some social media skills came in. It was a month of living on my phone, posting photos, thanking any person that donated. We outdid our goal. That really made me feel excited to open the shop, to see that other people were excited for us to be open. The first day we opened it was filled with people from different coffee bars, just hanging out. If you could have coffee with a famous woman (or group of women) living or deceased, who would you pick? If I could have a coffee date with Amy Poehler and Tina Fey, that would be phenomenal. I loved Amy Poehler’s book a lot and I just love her strength. Also their comedic energy. Amy Poehler and Tina Fey may not be attending our first Women of Cincy Boozy Hour, but Anne Decker and some amazing men and women in the community will be! Join us at Landlocked Social House on February 27th from 6-8 p.m. Sip on delicious coffee, beer, and cocktails and grab a bite to eat. Landlocked Social House is located at 648 E. McMillan St.